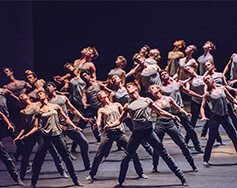 The contemporary face of The Royal Ballet is shown in works from three of today’s leading choreographers. Christopher Wheeldon’s Within the Golden Hour is based around seven couples separating and intermingling, to music by Vivaldi and Bosso and lit with rich colors suggested by sunset. Crystal Pite’s Flight Pattern, revived for the first time, uses a large dance ensemble and Górecki’s familiar music from his Symphony of Sorrowful Songs for a poignant and passionate reflection on migration. Between them, a new work by Sidi Larbi Cherkaoui, created on The Royal Ballet has its premiere to bring the contemporary truly up-to-date. The Royal Opera House celebrates 10 years of live cinema broadcasts in 2018, leading the way in delivering world-class opera and ballet around the world. The 2017/18 Season was the Royal Opera House’s most successful cinema season to date with more than one million tickets sold globally, including to more than 500 venues across the UK. The Royal Opera House has seen huge growth in the influence of independent cinemas, which now account for almost half of our network in the UK. Internationally, a partnership with Trafalgar Releasing sees our productions broadcast to up to 1,000 cinemas in 50 countries. Audiences are also able to access an array of livestreamed and on-demand content via the Royal Opera House YouTube channel, which is the most subscribed-to YouTube channel of any arts organization in the world.